Craig and I have talked about my taking up the organ again — I used to play in local churches as a teenager. 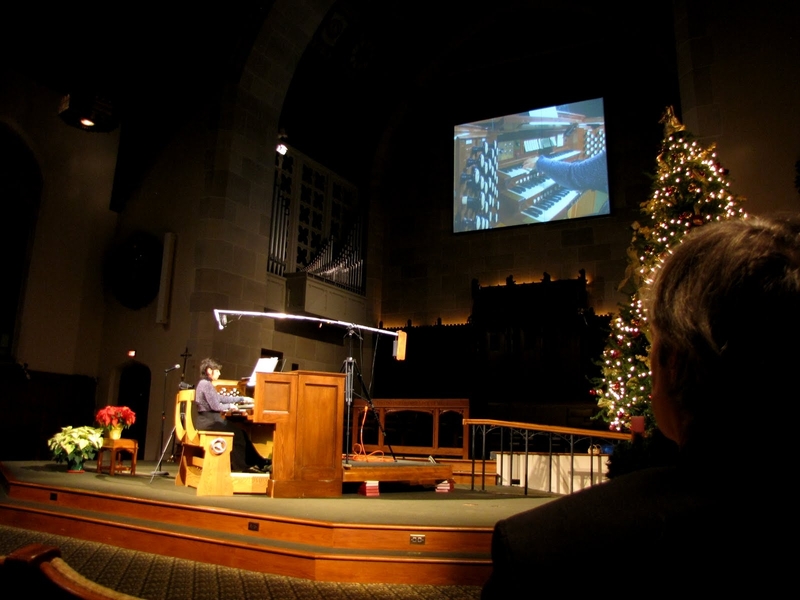 Last weekend I took the first step and attended a concert hosted by the Ann Arbor Chapter of the American Guild of Organists and the First United Methodist Church of Ann Arbor. The three soloists were really wonderful — it amazed me how each of them got such very different sounds out of the same organ, and had such markedly different styles. It really inspires me to get my own skills up to date! These concerts are a really wonderful way to introduce your children to the magic of pipe organ. There are several upcoming concerts, so if you’re in the area be sure to stop by and support the AGO! * “A Christmas Celebration” on Sunday, December 18 at 7 p.m., at First United Methodist Church (FUMC) in downtown Ann Arbor. * “Organ Music for Church Services: A Reading/Listening Session” on Saturday, January 15 at 10 a.m. at the First Presbyterian Church of Ypsilanti (300 N Washington St). This one is especially good if you want to beef up your church organist repertoire. * “Organ Plus Orchestra with Gale Kramer and Naki Sung-Kripfgans on Friday, Marcy 4 at 7:30 p.m. at FUMC. * “A Calendar of Hymns” on Sunday, March 6 at 4 p.m. at FUMC. * “J.S. Bach: St. John Passion” on Good Friday, April 22 at 7 p.m. at FUMC. This week at CatholicMom.com, I recount a story about Christopher. The stressors of his world … his school work, his piano lessons, his home work, and the changes that are part-and-parcel of the end of the year… were creating a short fuse. This post is short and sweet, because I’d like to open it to you, my readers. Have you ever been through a particularly stressful time with your grade schooler, and what did you do to help him or her through it? Also, if your child has been taking music lessons, what do you do to help your child get practice time in — and balance his other responsibilities at the same time?